The twin shipyards of Callisto stood side by side on the hemisphere of the moon that faced permanently away from Jupiter. The sun was only the brightest star in the endless night, the wide smear of the Milky Way brighter by far. All along the ridges of the craters, harsh white work lights glared down onto buildings, loaders, scaffolds. The ribs of half-​built ships arced up over the regolith of stone dust and ice. Two shipyards, one civilian and one military, one Earth-​based and one owned by Mars. Both protected by the same anti-​meteor rail-​gun defenses, both dedicated to building and repairing the vessels that would take humanity out to the new worlds beyond the rings when and if the fight on Ilus got worked out. Both in a lot more trouble than they guessed. Filip slid forward, the rest of his team close behind him. The suit LEDs had been gouged out, the ceramic plating scoured until nothing was smooth enough to cast a reflection. Even the heads‑up display was dimmed almost to the point of invisibility. The voices in Filip’s ears—ship traffic, security feeds, civilian chatter—were picked up on passive. He listened while transmitting nothing in return. The targeting laser strapped to his back was powered down. He and his team were shadows among shadows. The faint countdown timer in the left of his visual field passed the fifteen-​minute mark. Filip patted air barely thicker than vacuum with an open palm, the Belters’ physical idiom to move forward slowly. Around him, his team followed. High in the void above them, too distant to see, the Martian naval vessels guarding the shipyard spoke in clipped, professional tones. As thinly as their fleet had been stretched, they had only two ships in orbit. Probably only two. It was possible that there were others hidden in the black, hugging their own waste heat and shielded from radar. Possible but unlikely. And life, as Filip’s father said, was risky work. Fourteen minutes, thirty seconds. Two secondary timers appeared beside it, one with a forty-​five second counter, the other with two minutes. Somewhere up there, the Frank Aiken was painting the Martian ships with innocuous ranging lasers set at the same frequency as the one strapped to Filip’s own back. When the Martian comm officer spoke, there was nothing in his voice that showed fear. Filip’s crew topped the crater ridge, looking down at the no‑man’s‑land of the Martian military yard; it was just as he had expected it to be. He picked out the warehouses and supply depots. He pulled off the targeting laser, set the base into the dirty ice, and powered it up. The others, spread along the line wide enough that none of the guards would be out of all their sight lines, did the same. The lasers were old, the tracking platforms strapped to them salvaged from a dozen different sources. Before the tiny red LED on its base turned green, the first of his two secondary timers reached zero. The security alert tritone sounded on the civilian channel, followed by a woman’s anxious voice. The panic and alarm cascaded in his ears as Filip moved his team along the rim of the crater. Thin puffs of dust rose around them and didn’t fall, widening instead like a mist. The loader mech, failing to respond to overrides, trundled across the no‑man’s‑land and into the wide eyes of the meteor defense cannons, blinding them, if only for a few minutes. Four Martian marines emerged from their bunker, as protocol demanded. Their powered armor let them slide over the surface like they were skating on ice. Any one of them could kill his whole team and suffer nothing worse than a moment’s pity. Filip hated them all and each one individually on principle. The repair crews were already scrambling for the damaged array. The whole thing would be back in order within the hour. Filip paused, looking back at his team. Ten volunteer soldiers, the best the Belt had to offer. Apart from himself, none of them knew why the mission to raid the Martian supply depot was important or what it was leading to. All of them ready to die if he told them to, because of who he was. Because of who his father was. Filip felt it in his belly and in his throat. Not fear, pride. It was pride. Twelve minutes, thirty-​five seconds. Thirty-​four. Thirty-​three. The lasers they’d placed came to life, painting the four marines, the bunker with the backup team, the perimeter fences, the workshops, and the barracks. The Martians turned, their armor so sensitive that even the gentle caress of invisible beams of light was noticed. As they moved they lifted their weapons. Filip saw one recognize the team, gun shifting away from the lasers and toward them. Toward him. Eighteen days before, a ship—Filip didn’t even know which one—out in the Jovian system somewhere had made a hard burn, topping out at ten, maybe fifteen gs. At the nanosecond specified by the computers, the ship had released a few dozen lengths of tungsten with four disposable, short-​burn rockets at the center of mass and cheap single-​frequency sensors tied to them. They were barely complicated enough to be called machines. Six-​year-​old children built things more sophisticated every day, but accelerated as they were to one hundred and fifty kilometers per second, they didn’t need to be complex. Just shown where to go. In the time it took for the signal to propagate from Filip’s eye, down his optic nerve, and into his visual neocortex, it was over. He was aware of the thump, of the ejecta plumes where the marines had been, of the two brief new stars that had been warships overhead, only after the enemy was dead. He changed his suit radio to active. “Ichiban,” he said, proud that his voice was so calm. Together, they bounced down the crater’s side, shuffling their feet. The Martian shipyards were like something from a dream, plumes of flame rising from the shattered workshops as the stored volatile gasses vented as fire. Soft snow billowed from the barracks as the released atmosphere sprayed out and froze. The marines were gone, their bodies ripped apart and scattered. A cloud of dust and ice filled the crater, only the guidance of his HUD showing him where the targets were. Filip’s team divided. Three went to the middle of the open space, finding a place large enough to begin unfolding the thin black carbon structure of the evacuation scaffold. Two others unstrapped recoilless machine pistols, ready to shoot anyone who emerged from the rubble. Two more ran toward the armory, and three came with him, to the supply sheds. The building loomed up from the dust, stark and forbidding. The access doors were shut. A loading mech lay toppled on its side, the driver dead or dying. His tech specialist went to the door controls, prying the housing open with a powered cutting bar. “Trabajan, sa sa?” Josie replied curtly. The great access doors shifted, shuddered, and rose. Josie turned back and flicked the suit’s helmet lights on so that Filip could see the expression on his craggy face. They went into the warehouse. Towers of curved ceramic and steel made great piles, denser than mountains. Hair-thin wire hundreds of kilometers long stood on plastic spools taller than Filip. Massive printers waited, ready to fashion the plates that would fit together over the emptiness, define a volume and make it a bubble of air and water and complex organics that passed for a human environment. Emergency lights flickered, giving the wide space the eerie glow of disaster. He moved forward. He didn’t remember drawing his gun, but it was in his hand. Miral, not Josie, was strapping into a loader. The red-​and-​white strobe of the first emergency vehicles flickered in the chaos of the shipyard, the light coming from everywhere and nowhere. Filip shuffled down the rows of welding rigs and metal printers. Tubs of steel and ceramic dust finer than talcum. Spiral-​core mounts. Layers of Kevlar and foam strike armor piled up like the biggest bed in the solar system. In one open corner of the space, an entire Epstein drive lay disassembled like the universe’s most complex jigsaw puzzle. Filip ignored it all. The air wasn’t thick enough to carry the sound of gunfire. His HUD brought up a fast-​mover alert in the same moment that a bright patch appeared on the steel beam to his right. Filip dropped, his body seeping down in the microgravity more slowly than it would have under burn. The Martian jumped down the aisle. Not the powered armor of the guards, but a technical exoskeleton. Filip aimed for the center of mass and emptied half his clip. The rounds flared as they left the muzzle, burning their own fuel, tracing lines of fire and red-​gray exhaust through the thin Callistan air. Four hit the Martian, and gouts of blood drifted down in a frozen red snowfall. The exoskeleton flipped to emergency alert status, its LEDs turning a grim amber. On some frequency, it was reporting to the yard’s emergency services that something terrible had happened. Its mindless devotion to duty was almost funny, in context. It took Filip a moment to find the man. He was in his loader, his blackened vacuum suit becoming one with the huge mech as if they’d been made for each other. Only the dim split circle symbol of the Outer Planets Alliance still just visible beneath the grime marked Miral as anything but an ill-​kept Martian mech driver. The canisters he’d been talking about were still lashed to their pallets. A thousand liters each, four of them. On the curving face: High Density Resonance Coating. The energy-​absorbent coating helped Martian military ships avoid detection. Stealth tech. He’d found it. A fear he hadn’t known he was carrying fell away. The loading mech’s whirring was distant, the sound carried by the vibrations in the structure’s flooring more than the thin atmosphere. Filip and Josie moved toward the doors. The flashing lights were brighter, and had taken on a kind of directionality. Filip’s suit radio filtered through frequencies crowded with screaming voices and security alerts. The Martian military was ordering back the relief vehicles from the civilian shipyard, concerned that the first responders might be terrorists and enemies in disguise. Which was fair. Under other circumstances, they might have been. Filip’s HUD had the outlines of the buildings, the half-​built evac scaffold, its best guess on the locations of the vehicles given IR and light trace data too subtle for Filip’s eyes. He felt like he was walking through a schematic drawing, everything defined by edges, all surfaces merely implied. As he shuffled onto the regolith, a deep shudder passed through the ground. A detonation, maybe. Or a building finally completing its long, slow collapse. Miral’s loading mech appeared in the open door, backlit by the warehouse lights. The canisters in its claws were anonymous and black. Filip moved toward the scaffold, switching to their encrypted channel as he shuffled. “Small trouble,” Aaman said. He was with the scaffold. Filip’s mouth flooded with the metal taste of fear. Three minutes, forty seconds. Thirty-​nine. “Hang tight,” Filip said, his mind racing. His two guards stood by the evac scaffold, ready to shoot anybody that wasn’t them. The three builders were struggling with a brace. Filip jumped over to them, catching himself on the black frame. On the line, Andrew grunted. Once he saw the stuck connector, black grit fouling it, the problem was clear. In atmosphere, it would have just taken a hard breath to clean it. Not an option here. Aaman was digging frantically with a blade, flipping out tiny bit after tiny bit, trying to empty the thin, complex channels where the metal fit together. Aaman hauled the brace into place and tried to force the connection. It was close, very close, but when he tugged back, it came apart. Filip saw the man cursing, flecks of spit dotting the inside of his faceplate. If they’d only brought a can of air, Filip thought . . . Which, of course, they had. He plucked the knife from Aaman’s hand and shoved the blade into his suit’s wrist where the articulation made it thinnest. A bright pain told him he’d gone just a little too far. That was fine. His suit alarm blinked into place, and he ignored it. He leaned forward, pressing the tiny opening in his suit to the clogged connector, the escaping air scattering the dirt and ice. A single drop of blood spat out, freezing into a perfect crimson sphere and bouncing away from the material. He stepped back, and Aaman slid the connection together. When he tugged this time, it held. The injured suit sealed the hole as soon as he pulled the knife out. Filip turned back. Miral and Josie had cut the canisters free of their pallets and strapped one to the scaffold. The flashing emergency lights had dimmed, the relief vehicles passing them by in the haze and confusion. Heading, likely, for the firefight at the armory. It was where Filip would have seen the greatest threat too, if he hadn’t known better. One of the two guards put a hand on his shoulder. “You want me to go fix that?” she asked. Should I go save them? Filip lifted a fist and shook it gently back and forth. No. She stiffened when she understood what he was saying, and for a moment, he thought she’d disobey. Her choice. Mutiny now was its own punishment. Josie slid the last canister into place, tightened down the straps. Aaman and his people fit the last brace in position. “I’m sorry, Andrew,” Filip said. There was a moment of stunned silence and then a stream of obscenity and invective. Filip changed frequencies. The emergency services for the military shipyards were shouting less. A woman’s voice speaking crisp, calm German was delivering commands with the almost-​bored efficiency of someone well accustomed to crisis, and the voices answering her took their professionalism from hers. Filip pointed to the scaffold. Chuchu and Andrew were dead. Even if they weren’t dead, they were dead. Filip pulled himself into his position on the scaffold, fitted the straps around his waist and under his crotch, across his chest, then laid his head back against the thick padding. He turned his radio back to the encrypted channel. Andrew was weeping now. Wailing. The evac scaffold bucked under him, and he suddenly had weight. Four chemical rockets under high burn lit the ground below him, scattering the empty pallets and knocking Miral’s abandoned loading mech on its back. Acceleration pushed the blood down into Filip’s legs, and his vision narrowed. The sounds of the radio grew thinner, more distant, and his consciousness flickered, stuttered. His suit clamped down on his thighs like being squeezed by a giant, forcing the blood back up out of them. His mind returned a bit. Below, the crater was an oblong blister of dust on the face of the moon. Lights moved in it. The towers at the crater’s edge had gone dark, but flickered now as the systems tried to reboot. The shipyards of Callisto reeled like a drunkard, or a person struck in the head. The countdown timer slid to two seconds, then one. At zero, the second strike came. Filip didn’t see the rock hit. As with the tungsten slugs, it was going much too fast for mere human sight, but he saw the dust cloud jump like someone had surprised it, and then the vast shock wave, blooming out so powerfully that even in the barely-​extant atmosphere it was visible. “Brace,” Filip said, though there was no need. Everyone on the scaffold was already braced. In a thicker atmosphere, it would have been death for all of them. Here, it was little worse than a bad storm. Aaman grunted. The scaffold rockets exhausted themselves; the acceleration gravity dropped away. Below them, death had come to the shipyards. There were no lights now. Not even fires burning. Filip turned his gaze to the bright smear of stars, the galactic disk shining on them all. One of those lights wasn’t a star, but the exhaust plume of the Pella, coming to collect its wayward crew. Except Chuchu. Except Andrew. Filip wondered why he didn’t feel bad about the loss of two people under his command. His first command. His proof that he could handle a real mission, with real stakes, and come through clean. He didn’t mean to speak. Maybe he didn’t. Maybe it was only a sigh that passed his lips. Miral chuckled. Filip Inaros lifted his hands in thanks. It was his fifteenth birthday. 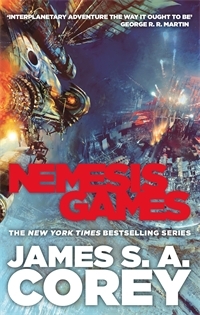 James S. A. Corey is the pen name of fantasy author Daniel Abraham and Ty Franck.